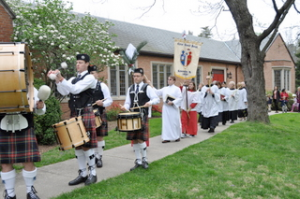 At Christ Church, we have a variety of worship styles. Our 8:00 Holy Eucharist service on Sunday mornings is an intimate group that revels in the traditional language of Rite I and enjoys the service in contemplative silence. Our 10:00 Holy Eucharist service attracts people of all ages including our families with children. 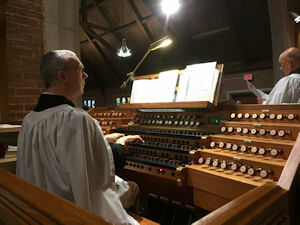 The service uses the more contemporary language of Rite II and Enriching Our Worship. Our choir supports our lively congregational singing during this service. Infants and small children are welcome for the whole service or there is Children’s Chapel downstairs during the first part of the service. Nursery care is available if desired from 9:45 to 12:15. Then, our 5:00 “Come as You Are” Holy Eucharist service blends the ancient and the contemporary. Using prayers from the early church to contemporary times, this service is perhaps our most experimental. It has a very laid back feel as we enjoy singing together with piano and guitar accompaniment. During the week, we have a Wednesday evening Evening Prayer and Holy Eucharist service at 6:30 – a contemplative break in the middle of a frantic week for many. This service takes place in the choir allowing the small group to be close. In addition to our regularly scheduled worship services, we have special celebrations for Christmas, Twelfth Night, Holy Week, and Easter.